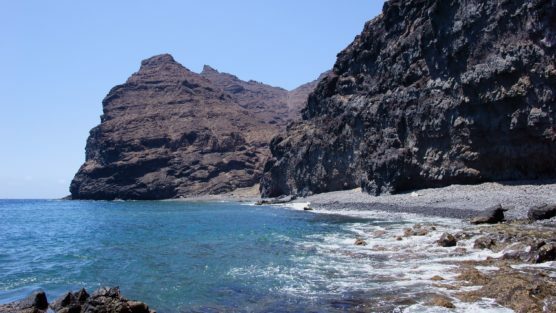 the 7 best nudist beaches in the Canary Islands: where to go? More and more people each year are going to the nudist beaches in the Canary Islands. There are many difficult-to-access beaches on the island, so they become ideal places for those who look for quiet places to sunbathe or take a dip. Actually, nudism is legal on any beach, but there were established some boundaries of the space between clothed and nudists that both groups respect. 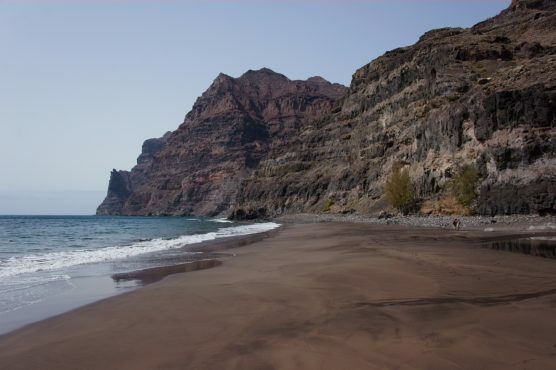 Therefore, the south part of Gran Canaria offers the greatest number of places where naturism is concentrated. 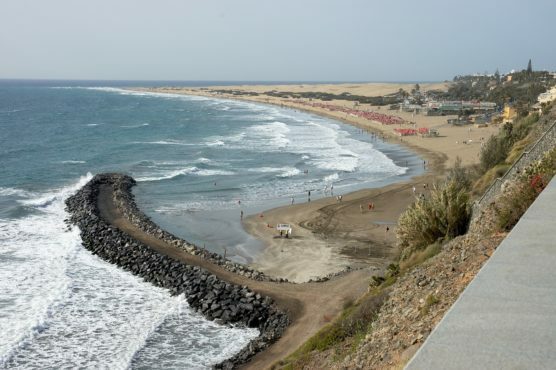 Maspalomas is one of the best nudist beaches in the Canary Islands that you can visit. It is situated in the southern part of the municipality of San Bartolomé de Tirajana and disposes of many facilities. 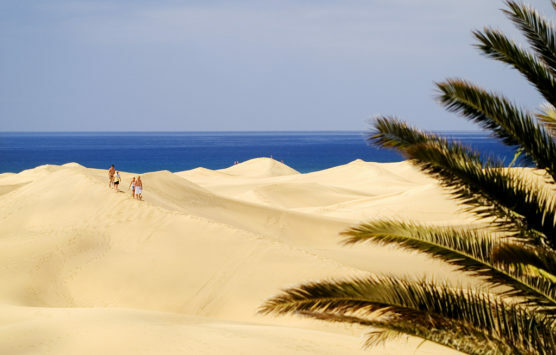 Besides, it’s located in a beautiful natural environment thanks to the dunes of Maspalomas. Its waters are crystal clear and calm, with golden fine sand. ❧ To go to Maspalomas from the airport or from Las Palmas de Gran Canaria you must take the main highway GC-1 in a southern direction. How to find the nudist area? It is about 20 minutes walk from the Maspalomas lighthouse and there is a sign that indicates it. The nudist zone reaches out to the beach bar 3 of Playa del Inglés, where the end is also marked. 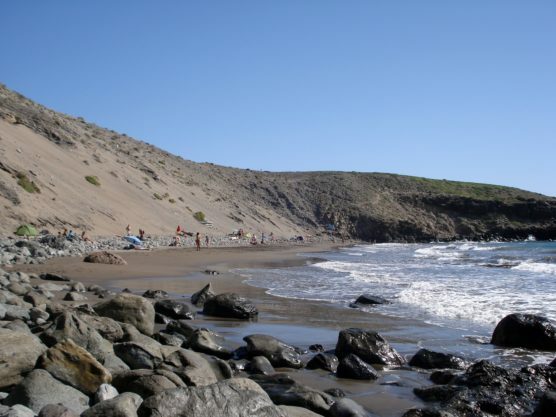 Bordering the Maspalomas, is located the Playa del Inglés. Here the nudist zone is between the chiringuitos five and six, and the part that pertains to Maspalomas, between three and four. If we add the length of the two beaches, they comprise 2,700 meters of beach strip. Both of them have different facilities including lifeguard. It’s a virgin and quiet beach, far away from the tourist areas. There are no lifeguard or facilities (not even coverage!). It’s 250 meters long. The sand is dark and the sunsets are always beautiful to contemplate due to its southwest orientation. If you are traveling with a pet, you will like to know that it’s also a pet-friendly beach. There are no umbrellas or shaded areas, keep this in mind if you are planning to stay longer. ❧ You can get to the beach from the old southern road: the GC-500. You can park your car and walk down to the beach. 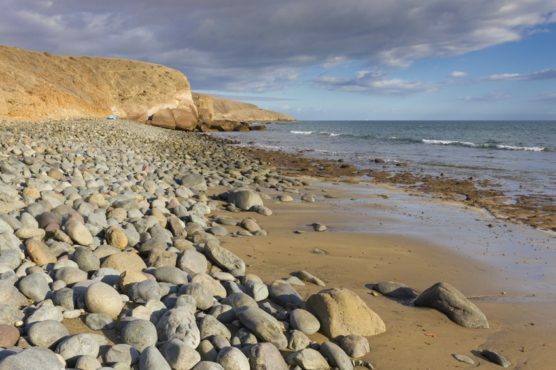 This beach is also located in San Bartolomé de Tirajana, but it is absolutely untouched by the human hand, thus there are no facilities provided. Its waves are bearable and appropriate for surfing. They can reach a height of 30 meters. It is sandy but also has pebble areas. This beach is isolated from the most touristic beaches, so it is quieter and less busy. When it’s low tide you can walk to Llano de los militares. It’s a beach with remainings of a Canary settlement where you can snorkel or fish. ❧ How do you get to Playa de Triana? On the same road as to go to the Montaña de Arena beach, from the GC-500. It’s a small beach that is in the municipality of Arucas. It is rocky and the waves are strong, so it’s unusual to be crowded. It’s surrounded by nature and better bring something to eat because there are no facilities established there. The best part? It has formed natural pools that look like heaven but they are safe for bathing. It’s situated in the Village of San Nicolás and it’s 465 meters long. It’s an area with little traffic but with relatively high occupation level in summer. It consists of dark gravel. There is no lifeguard or facilities. The entire coastline is surrounded by mountains which contrast with the sea – beautiful scenery to see! Getting to this beach involves more efforts as it’s the most difficult beach to access on the island. It is considered as a little paradise on Earth. It’s got black sand and crystal clear water. It is located in the municipality of La Aldea de San Nicolás, between the beach of Tasartico and the beach of La Aldea. ❧ Getting to Güi-Güi on foot is an adventure and requires to be fit. The starting point is the small town of Tasartico. You will need to go through a 5-kilometer road that crosses mountains with a steep slope. Wear comfortable and appropriate clothing and shoes, avoid sunny hours and carry a backpack full of water and food: there is nothing there but beautiful nature. When you cross the Güi Güi ravine, you will see the efforts and struggles have been 100% worth it. ❧ Another option is to arrive by boat from La Aldea or Mogán, as long as the sea is calm. 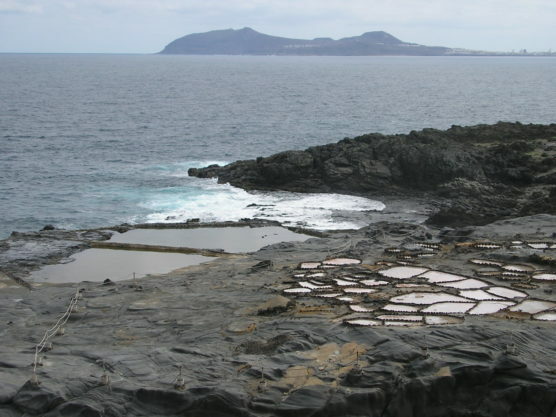 This is our selection of nudist beaches in the Canary Islands! You will see that they all have their own particular charm. Can you recommend us some more? Don't wait until the summer vacation Book Now!